The boa constrictor is a large snake that lives in tropical parts of the world. It kills its prey by squeezing it to death with its body. The offered item is not quite as deadly, but it still kills … by its awesomeness! This amazing and rare small-sized boa constrictor horn, dating to 1905, features a serpent’s head attached to a flexible, coiled body. The “tail” features a black rubber bulb. The head of this elaborate horn was designed to be mounted alongside a vehicle. 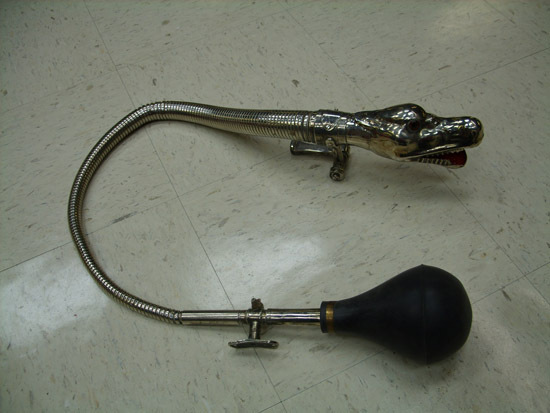 The handle (within reach of a driver) was also mounted to the vehicle’s exterior, enabling him to give a good squeeze and emit a blast when necessary. A metal plaque is attached to the serpent’s neck. Though most of the lettering is worn off, the words “Boa Constrictor” and “British Manufacture” are still apparent. 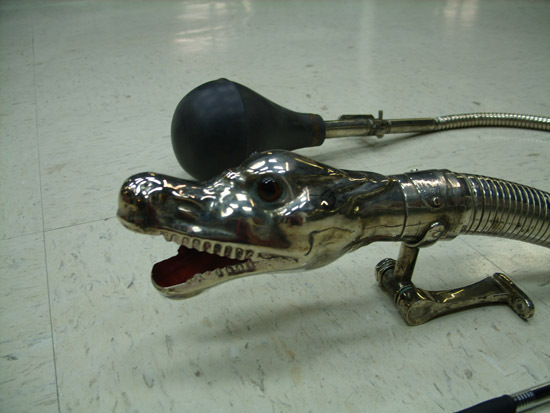 The English Boa Company produced two sizes of the famous “serpent Head Horn” This particular one is the rarest, being the small size, making it highly desirable. This superb item measures 48″ in length. Its red-painted mouth and glaring eyes are as exciting today as they were a century ago!